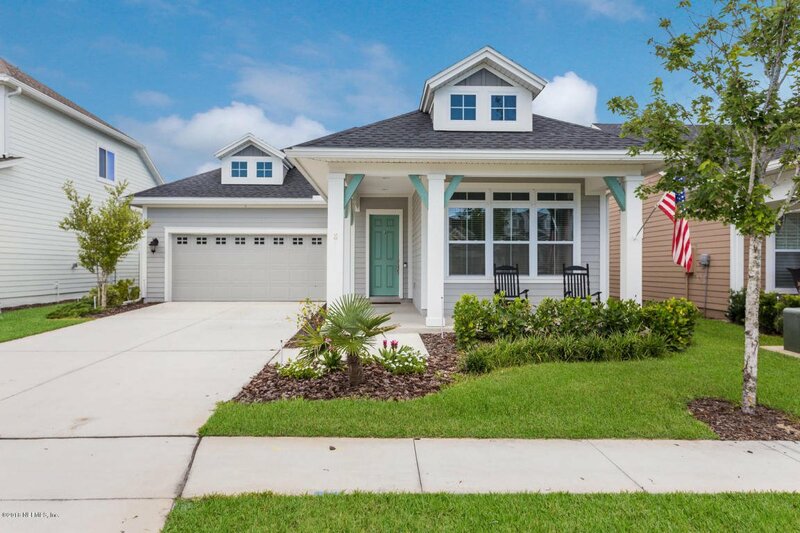 Wonderfully appointed David Weekley coastal elevation home with super easy access to the Nocatee Town Center, Splash Park, Farmer's Market, Publix, & restaurants! This beauty features 4 bedrooms, 3 baths incl. a private guest suite, plus a separate office/playroom. An open fully equipped deluxe kitchen with 42 inch Espresso cabinets with crown molding, granite tops, stainless steel appliances incl. vented gas cooktop, oven/microwave tower, and refrigerator make this a chef's delight. Other amenities include 20 inch tile throughout except bedrooms, walk in shower with rain shower head, granite tops on master vanity, laundry room with counter and sink, pull down stairs in garage for storage access, easy maintenance Hardie-lap siding, front porch, and an oversized rear screened in porch. Listing courtesy of RE/MAX SPECIALISTS. Selling Office: KILLEBREW AND COMPANY REALTY.